Given the strategic importance of electronic ecosystems in capturing customer attention - and the attendant data and revenues that flow from it - this relatively small piece of 'real estate' may make or break the future of companies and industries. The auto industry and Silicon Valley are locked in a battle for control of one of the last unconquered screens: your car dashboard display.At stake are billions of dollars in revenue from ads and services as well as the balance of power between industries.Car makers are counting on these few square inches to help build closer relationships with customers. Some fear handing control to Silicon Valley. Alphabet and Apple, meanwhile, are itching to put their familiar screens and apps inside vehicles. The auto industry and Silicon Valley are locked in a battle for control of one of the last unconquered screens: your car dashboard display. At stake are billions of dollars in revenue from ads and services as well as the balance of power between two big industries. And then there is the future of the dash itself, a source of endless complaints from drivers frustrated by its glitchy concoction of buttons and technologies. Car makers, trying to overcome this poor track record, are counting on these few square inches to help build closer relationships with customers. Some fear handing control to Silicon Valley. Alphabet Inc. and Apple Inc., meanwhile, are itching to put their familiar screens and apps inside vehicles. The current state of play is a confused free-for-all as the two industries circle each other warily. Some car makers are turning over their dashboard operating systems to Alphabet’s Google entirely. Others, including Ford Motor Co. and Daimler AG , wager they can muster the technological chops to compete. The average American driver spends 51 minutes a day in the car, according to a study earlier this year by the AAA Foundation for Traffic Safety, making them a literal captive audience. These data-driven products could create as much as $750 billion in new revenue by 2030, including from location-based advertisements and predictive car maintenance, McKinsey & Co. has estimated. “We see this as the battle for the fourth screen,” after the television, computer and mobile phone, said Ky Tang, an executive director at Telenav Inc., a Silicon Valley firm that provides map-based advertising to auto makers competing against Google. Auto makers start with a natural disadvantage. New car models are designed and engineered several years out and customers tend to hold on to their cars more than they do phones. Car companies had been reluctant to spend money on expensive electronics, and older car displays weren’t designed to be updated. electronics is one reason the company developed its own car computing brain, with its own online store of apps and services. The system will debut later this year on a new generation of Volkswagen-branded electric cars, called the I.D. series. “Like Android and [Apple] iOS, we are building our own vw.os as the platform,” said Chief Executive Herbert Diess during an earnings briefing last month in Germany. Volkswagen declared internally it would fast-forward efforts to combat Silicon Valley’s encroachment into cars after a private meeting in 2016 between Google Chief Executive Sundar Pichai and Mr. Diess, then chief for the VW brand, according to people familiar with the matter. Mr. Pichai explained how Google wanted the data to improve the user experience, and asked if Android were installed whether Google could access the car’s fuel levels, people with knowledge of the meeting said. That way Android could determine the need for gas and offer directions to a fuel station, the people recalled Mr. Pichai saying at the meeting. Mr. Diess was concerned about the privacy of this information and walked away convinced that Google would be more a competitor than partner, the people said. A Google spokeswoman said the company works in collaboration with its car-manufacturing partners, and prioritizes their needs to meet market demands and optimize the driving experience. She also pointed to the company’s data-collection policy, which requires it to get driver approval before accessing any information. Data privacy is a particular concern for German car makers, especially with Silicon Valley’s use of consumer data coming under greater scrutiny in Europe. One former executive at BMW AG said he attended a meeting several years ago in which Google executives asked if BMW could put sensors in the passenger seat to determine the occupant’s weight. Puzzled, BMW executives asked why Google would need such info and were told Google wanted to determine whether a child or an adult was riding in the car, this former executive said. BMW currently allows users to plug their Android and Apple phones into their system, but doesn’t use the Android operating system to power its screens. BMW has worked to improve its own system since it surveyed its customers in 2015 and found that no one was using the expensive multimedia displays designed by the auto maker, turning to their phones instead to play music and pull up directions, according to the former executive. Fearing Google would become the default for in-car maps, BMW executives decided they needed to improve. That same year, BMW joined rivals Volkswagen and Daimler to buy mapping firm HERE for $3.1 billion from telecom-equipment maker Nokia Corp.
Daimler used its own developers to build the software backbone for Mercedes-Benz’s new MBUX multimedia system, including a natural-speech assistant called “Hey Mercedes.” The system gives the company strict control over outsider access and what flashes across the screen. Marc-Oliver Nandy, head of Mercedes digital sales, said they want to keep strong influence over what is shown on the road because auto makers are liable for the car and the driver’s safety. In Detroit, Ford hired 400 engineers from BlackBerry Ltd. in 2017 to bolster its in-house software expertise and to help develop new in-car digital features that will roll out next year. We need to control the user experience,” said Don Butler, Ford’s executive director of connected vehicle and services. Other makers are taking a middle-of-the-road approach. General Motors Co. has based its system on free software from Google but highly customized it to create its own experience. Google’s software—whether a free version that car companies can customize or a fully integrated system—is in 19% of all in-car operating systems, a number that’s expected to rise to roughly one-third in 2024, according to IHS Markit, a data and analytics firm. Toyota is using a customized version of an open-source operating system called Automotive Grade Linux to run its connected cars and infotainment systems. The system made its debut in the U.S. on the 2018 Toyota Camry. Beyond Apple and Google, other tech companies are working to get their offerings incorporated into car systems. Samsung Electronics Co. , the world’s largest smartphone maker by sales, purchased auto-supplier Harman International Industries Inc. for $8 billion two years ago to get its hardware into cars. Harman showed how it can integrate video screens and user experiences in the car at the annual CES tech show in January. Microsoft Corp. is also edging in, providing auto makers such as Volkswagen and BMW with cloud-based services that help them beam down new apps and software to the car. Amazon.com Inc. is in the midst of rolling out its Alexa voice assistant in BMW, Toyota and Volkswagen models, though it’s limited in what it can do. Google’s push into the car is part of a larger strategy to provide more services and content across platforms, starting with its 2005 purchase of the Android operating system. This ecosystem allows customers access to their digital lives on different screens and helped Google generate an estimated $82 billion in mobile advertising revenue last year, according to eMarketer. “What we realized, I think, just as we did with the mobile phone, to make that transition easy we need to have a common platform in the car,” said Mickey Kataria, a product management director at Google, in an interview. The launch of self-driving vehicles in the coming years could bring even more screens into the car, on and off the dashboard, as passengers get more time to work, shop or watch movies on the road. Last year, the Nissan-Renault-Mitsubishi alliance—one of the world’s largest car-making groups by sales—entered into a partnership with Google to eventually install its operating system in the 10.6 million cars the alliance sells globally each year. Renault SA CEO Thierry Bolloré said the decision to work with Google wasn’t easy. “We spent more than four years, almost five, to find an agreement with our new Google friend precisely to have control of the data,” said Mr. Bolloré, who declined to disclose the final contract terms. 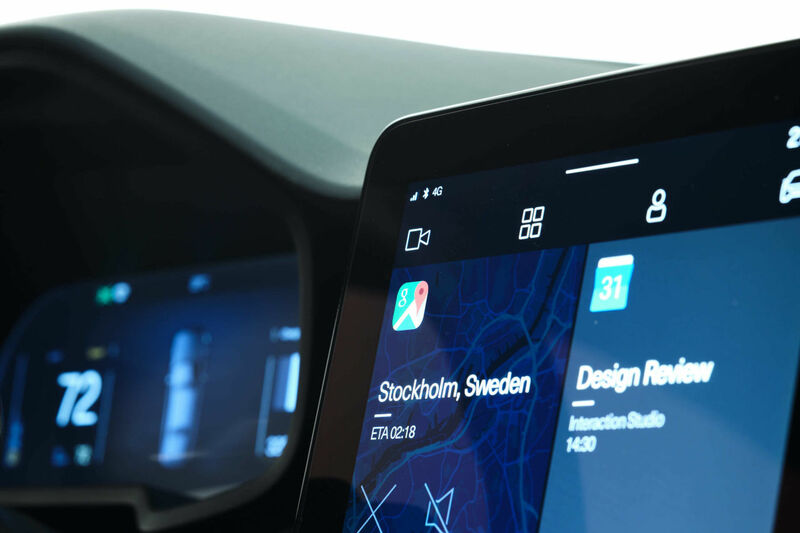 Next year, Volvo will roll out a new Google-developed operating system for its cars starting with the Polestar brand, with a unique look to the brand, that will make the display screen look like an electronic tablet with Google Maps and telephone service Google Voice built in. Drivers will be able to download from Google’s app store and use its turn-by-turn directions, and Volvo can rely on its partner to update the software, rather than do it solely on its own. Some inside Volvo had voiced concerns about handing over its system to an outsider, said David Holecek, the company’s director of digital experience, but ultimately found the proposal resonated with senior leaders. CEO Håkan Samuelsson equated the risk of spending money on their own system with another long-ago tech battle between Beta and VHS to win the home video market. Auto makers will be challenged to break Android’s grip on the apps market, Mr. Samuelsson said in an interview.“All of the smart app developers in the world will, of course, develop for Android or [Apple’s] iOS,” he said. The dashboard display mattered to Paul deGrouchy, a sales executive in the Baltimore area, when he was recently shopping for a car. He was close to buying one brand until he saw it didn’t offer Apple CarPlay. He went with an Audi Q5 sport-utility vehicle instead, and uses his iPhone’s Pandora music app and Waze navigation app frequently in the car.